Since 9/11, many films have given their vision of the tragedy, ranging from the exceptional United 93 (not to be confused with the big-swing-and-miss Flight 93) to the embarrassingly unprofessional Loose Change, to the thought-provoking World Trade Center and 25th Hour. 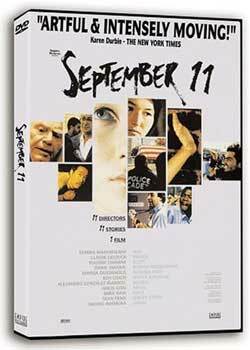 But of all the film tributes, the most relevant remains the earliest: 11'09''01: September 11. Released just a year after the World Trade Center attacks, the movie is a composite vision of that historic moment as interpreted by eyes the world over. Eleven short films from eleven different countries (at eleven minutes and nine seconds apiece) combine to create a brilliant, sometimes critical, picture of an event that has dramatically altered our perspectives of ourselves, history, and our future. September 11 is a brain-full. The movie counts among its highest profile contributors Academy-Award-winning actor Sean Penn, who directs the U.S.A. segment, and Mexico's Alejandro González Iñárritu, who has since emerged as one of cinema's most provocative directors with movies like 21 Grams and Babel. But notoriety and impact don't necessarily go hand-in-hand in this collection of shorts. The most outstanding contributions belong to the opening film from Iran, focusing on a teacher in a poor village trying to explain to oblivious five-year-olds the tragic significance of what's transpired half-a-world away, the middle entry from Burkina-Faso, wherein a posse of naïve boys with dreams of reward pledge to capture Osama bin Laden, and Japan, which appropriately ends the movie with a symbolic World War II story. Of the remaining shorts in the anthology, those that are still very good include the critical ones from Egypt and the U.K. and the sentimental ones from the U.S.A. and France, along with an Indian entry which successfully straddles both sentiments, while the Bosnia-Herzegovina, Mexico, and Israel entries are surprisingly, even disappointingly, simple. But taken together, the films form an ensemble the scope of which opens our eyes to a world far larger, diverse, and complex than that we know from our day-to-day lives--yet it's one that remains wholly human. Despite criticisms, the United States remains the guiding light of the free world. No other nation has so ably struck a working balance between appeasing the wants and needs of so vast and unwieldy a medley of human beings while also producing an environment conductive to economic, social, and technological progress and granting its citizenry a freedom of choice and opportunity that would make even the debauched gods of Olympus jealous. But the favor of these circumstances, of this luxurious existence, is also why the global reaction to this country's comportment since September 11, 2001 has been such a critical one. While not as slick as more recent film takes on 9/11, September 11 remains the most perceptive and instructive, asking the citizens of the United States to look at ourselves not only as a nation but as the most influential player, for good and ill, on an all-too susceptible world stage. For more thoughts on 9/11, check out my 10/01/2006 column. Till next time, folks.